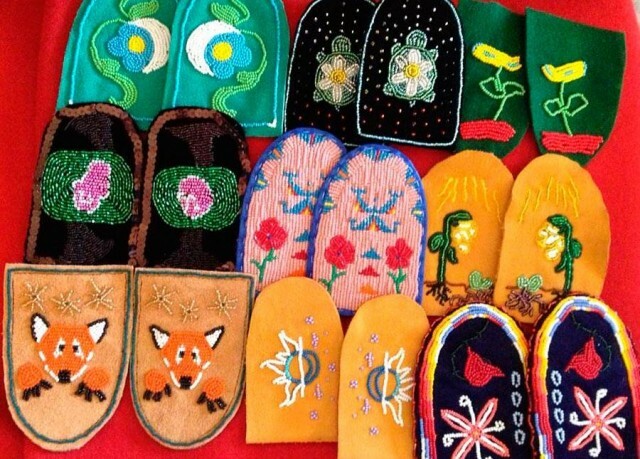 Moccasin vamps made by Brandon University students in Cathy Mattes’ Advanced Aboriginal Design Class: Brianne Cooper, Andrea St. Pierre, Audrey Cook, Amy Gies, Catherine Forest, Brooke Piche, Cameron Flamand, Kevin Tacan and Ashley Swiminer. Brandon Man. 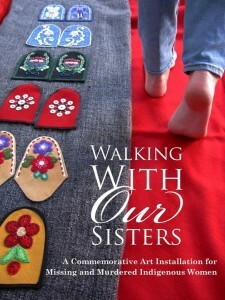 – The North American touring art project Walking With Our Sisters (WWOS) is coming to Brandon from February 22 to March 6. The commemorative exhibition will be hosted at Brandon University’s Down Under space below the Harvest Hall dining room. The Walking With Our Sisters exhibit, commemorating missing and murdered Indigenous women, will be in the Down Under space at Brandon University from Feb. 22 to March 6. The project features 1,808 pairs of moccasin vamps (also called “uppers” or “tops”) created and donated by hundreds of caring and concerned individuals to draw attention to 1,200 women and girls who have been murdered or gone missing across Canada since 1980. The adorned vamps are intentionally not sewn into moccasins to represent those whose lives were cut short. Among the vamps are 108 that were created to honour the children whose lives were lost in the Canadian residential school system. This art project was initiated by Metis artist Christi Belcourt in 2012 out of concern for the high number of missing and murdered Indigenous women and girls. As it travels to communities, local Indigenous and non-Indigenous community members organize the art project with guidance from Belcourt and the National Organizing Committee of WWOS. Multiple local organizations and institutions are partnering with the local organizing committee of WWOS to ensure its success, including the Brandon Friendship Centre, Manitoba Metis Federation Southwest Region, Brandon University, Brandon Urban Aboriginal Peoples Council, and the Art Gallery of Southwestern Manitoba. For more information, or to volunteer, go to Walking With Our Sisters – Brandon on Facebook; email Cathy Mattes at WWOSBrandon@gmail.com; or visit walkingwithoursisters.ca. Thursday, Feb.18, 9 a.m. – A pipe ceremony starting the commemoration, the lighting of the sacred fire, and welcoming of North Battleford volunteers transporting the bundle will take place in He Oyate Tawapi (Ceremony Room) in the Health Studies Building. Long skirts are encouraged. Everyone is welcome and volunteers are encouraged to attend. Monday, Feb. 22, 9 a.m. – A one-time, special media access event to the WWOS commemoration in order to allow the media to capture film and photographs at the Down Under space, beneath Harvest Hall. Monday, Feb. 22, 10:30 a.m. – A private viewing for family members and loved ones in the commemoration space at Down Under. For more information, contact Nellie Kopitz at bfcwellness@wcgwave.ca or 204.726.1112. Monday, Feb. 22, 1 p.m. – Opening ceremony for the WWOS commemoration at Down Under. Everyone is welcome. No cameras or video or audio recordings, please. Note: Parking for WWOS at BU will be available in lots 1, 4 (South side), 5 and 6. There will be directional signs to parking and the WWOS installation space on campus. For more information contact WWOSBrandon@gmail.com or visit Walking With Our Sisters-Brandon on Facebook.